Overloaded with lot of photos? Don’t have time to process and correct each photo one by one? You can save lot of time and effort by working on multiple photos in batches. 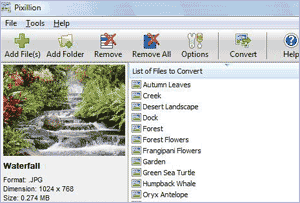 Pixillion Image Converter is a free software that supports basic image operations in batch mode. You can use this to convert image format of multiple photos in one go. It support huge list of image formats including : .png, .gif, .jpg, .jpeg, .bmp, .jp2, .psd, .tga, .pcx, .tif, .tiff etc. You can load images directly from a CD, Windows folder or drag and drop them straight intoÂ the application. Watermark with varying transparency can be added to images real quick. It also support image preview in full screen mode. Download Pixillion Image ConverterÂ [link], it is all free for download and use. It works fine on Windows 98, 2000, XP, and Vista. You can also download their full version of QuickResizer image resizer if you want to resize multiple files in a folder with just a click of the mouse.